As much as I would have liked fall running weather to continue a little bit longer, winter is officially on it’s way to the Twin Cities. Or it’s already here because as I’m writing this post it is in the mid-20s and there’s a decent layer of snow on the ground. 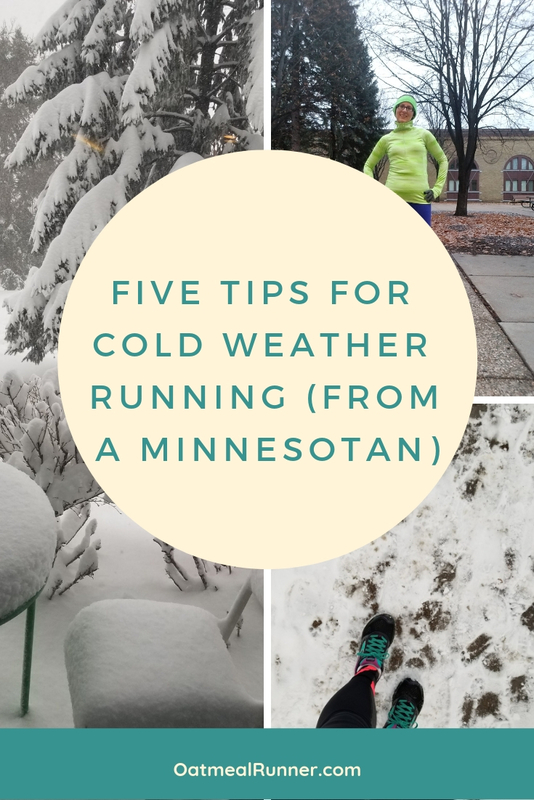 So grab your mug of peppermint mocha (or other seasonal drink of choice) and read on for some cold weather running tips from a Minnesotan! Layering is the easiest way to keep, but not hot, during the winter and cold weather running. For me, this usually means wearing a long sleeved shirt under my running jacket (bonus points for thumbs holes since then my hands are kept warmer) and when it gets extra cold outside, wearing two pairs of gloves. But yes, I’m switching over to the mitten train for my outer pair this year. Check out my post from 2017 on how I dress to run in a Minnesota winter, layer by layer! Warming up before a run is so important during the winter. You do not want to be going out for speedwork (if the paths are safe enough) or a long run on cold muscles, especially if you have to drive to your location. During the winter, I warm up either inside the apartment or apartment gym when I’m running from home or I’ll add on an extra layer if I need to do my warm up outside (and store it in my car before heading out on my run). Check out my quick five minute pre-run warm up routine that will help get you ready to run year round! Between it getting darker outside earlier, cold temperatures and icy paths, sometimes it just isn’t safe to hit the treadmill. I’m already looking at taking my interval runs inside now that the sun is setting around 5 p.m. because running at that pace with my headlamp just won’t be comfortable. Treadmill running isn’t as enjoyable (for me at least) as running outside but by keeping safe, you can keep running injury free through the winter and be ready for spring races. Check out my tips for treadmill running after I hit the treadmill for a 20 mile training run for the Eau Claire Marathon! Especially once we get into January or February, I get cold quickly after I’m done with my runs. Instead of trying to stretch and foam roll cold muscles (not a good idea! ), I warm myself up again before. This might mean getting some light cardio time or hitting the sauna in at the gym or taking a shower as soon as I get home. This will help your muscles be ready to stretch and can avoid injuries from stretching muscles that aren’t prepared for it. Check out why I love spending time in the sauna post-run! Don’t think that since it’s cold outside and you don’t feel thirsty, that you don’t need to drink water. It might be a pain since you have to carry it and you don’t want to drink something cold when it’s below freezing. You don’t need as much as during the summer but don’t skip it all together. Check out my tips for how I carried water while training for a spring marathon (during a Minnesota winter)! Have you started getting into cold weather running where you are? Share what cold weather is to you and your tips in the comments! It’s almost the end of October and fall running is in full force in Minnesota. And along with that comes the swing of fall temperatures that really make me think of what I’m going to wear on the run. So today, I’m dedicating some time to how I run when the weather changes from day to day (or even within the matter of hours)! No matter how I feel while running, during the fall I make sure I have layers to wear immediately afterward. Sometimes it’s just a jacket, some time it’s a pair of long pants too but I know after I’m done running I start getting cooler. And since I’m usually doing something else before I can shower and change (whether I’m just taking Vinnie on a walk or doing grocery shopping on the weekend), I don’t want to get cold because I wasn’t prepared. I always have to remind myself not to dress to feel warm when I first step out the door but to feel slightly cool. If I forget and dress too warm, even though it’s comfortable at first, I will start feeling way too warm once I get about half an hour into my run. On my weekend runs, I’ve found myself bringing along lightweight gloves more often than not. With the sun sometimes not out and the cooler morning weather, gloves help keep heat in and my hands warm (especially on my long runs where I’m carrying weather). Plus they are super easy to stuff into my handheld pocket (or if I need to, in my bra) if I find my hands get too warm. This might not be the most fun run but I found during my pace run last Saturday that passing by my car midway through was really helpful. I had been wearing a long sleeved shirt plus a running jacket since it was really windy outside (gusts of 25+ mph). It was comfortable for the first loop but I knew I was warming up and I’d be getting warmer as I started the second loop and got out of the wind. So I dropped the jacket off at my car and held onto my gloves (luckily I didn’t throw them in the car because once I got back into the wind I needed them). I’m not a big online clothing shopper because I like to be able to try on clothes before buying. I like to know how the fabric feels and if it fits me correctly without having to deal with hassel of shipping stuff back for a return. But when the people in a fitness-related Facebook group were raving about the 90 Degree Leggings by Reflex on Amazon, I knew I had to check them out. And they are my favorite pairs of leggings! I have three pairs of them and they are the most comfortable and flattering leggings I’ve owned. Plus they are at an awesome price point at around $20 per pair. I’ve been working out in one pair of these leggings (my Reflex Blue ones) since December 2016 and they still look and feel the same as the day I ordered them. No signs of wear or pilling and they are still squat proof. I wash them the same as all my other workouts clothes, in one big load and then everything is hung to dry. What types of workouts have I done in these leggings? Everything I do! Because they are a silky material that stops mid-calf on me, I don’t usually grab them for yoga. I did that once and it was hard for my foot to stay in tree pose because it was sliding down. But weights, running and spin class have all been fantastic in them! One downside is they seem to attract pet fur like nothing I’ve ever seen but that’s just the material they are made of. My black pair is the worst for showing Vinnie’s fur but it’s also the small price you pay for having a loving animal in your house. All three colors I own are squat proof (they don’t show through when bending over or squatting) but I also have only bought darker colors. They have some awesome lighter colors that I’d like to try in the future but haven’t. I’ve heard the lighter colors are less squat-proof but this might depend on your body type and how they fit you. We are technically into spring according to the calendar but the weather doesn’t always reflect that. 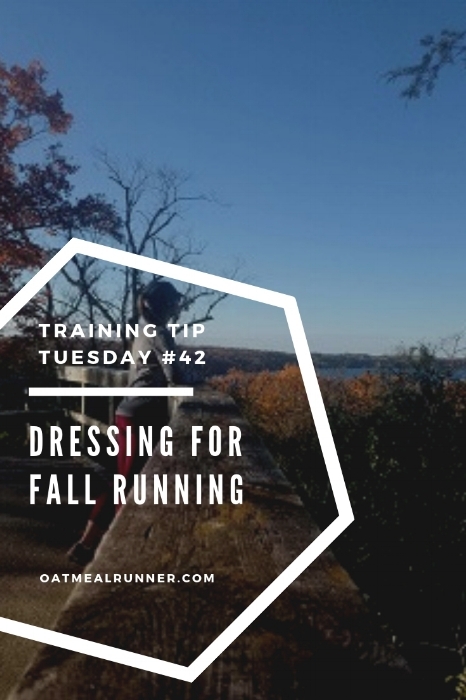 So I wanted to give some quick tips today for transitioning into spring running and being prepared for the (always) changing weather. I’m sure you already od this but I’ve found it to be so important to be checking the hourly forecast during the spring. The weather can change so quickly and (depending on what time you run at) you can’t always just look at the high for the day. The big thing that I have to be prepared for is wind (both direction and speed) along with precipitation (ranging from snow to rain and everything in between). I know layering isn’t something you want to hear for spring running but it will help you be prepared for whatever happens on your run. If you run from home, it can be a lot easier to know exactly what the weather will be like so you don’t have to dress in as many layers. But, if you’re like me and running right after work, you might be packing your running clothes in the morning. In the spring, I make sure to throw a jacket and baseball cap into my bag even if the forecast doesn’t call for rain. Because you never know…. Now that we are warming up in Minnesota and the snow is melting, I know my allergies are going to start acting up. If you are also to allergic to everything outside (as proven by the allergy testing I did over the winter), get ahead of allergy season with whatever medicine you take. Hopefully it will mean you aren’t as miserable on your runs. What are your tips for going into spring running? Let me know in the comments!